Pat Martino is an Italian-American jazz guitarist and composer within the post bop, fusion, mainstream jazz, soul jazz and hard bop idioms. 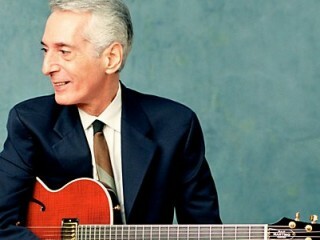 Viewing his career as a lifetime commitment, jazz guitarist Pat Martino told Jon Andrews in Down Beat, "A jazz musician doesn't retire." Although he took several sabbaticals to overcome incredible adversity, Martino always returned to his love of music. From the time he was a teenager, his dedication and talent fertilized his roots and made him one of the masters of the jazz world. Martino was born Pat Azzara in Philadelphia, Pennsylvania. Before he could crawl, his father, Carmen Azzara, began the child's musical education. Though a tailor by trade, Carmen Azzara had taken guitar lessons from jazz pioneer Eddie Lang and decided Pat should play guitar while he was still very young. When Pat was just two years old, he sneaked into his parents' bedroom to play with his father's guitar, which he was strictly forbidden to touch. When young Martino cut his finger on the strings, he became fascinated with the color of his own blood and painted the walls and floorboards with it. After this incident, his father continued to use the "reverse psychology" method by insisting the boy stay away from the guitar. By the time Pat was 11 years old, he received his own guitar and began taking lessons. His playing progressed at a phenomenal rate, and he had formed most of his technique by the time he was a teenager. At the age of 15, Martino dropped out of high school, changed his name for his father's stage name, Mickey Martino, and headed out on tour with Lloyd Price. He played with Price off and on for the next five years. In 1965, Pat Martino replaced George Benson in Jack McDuff's group. And the following year, at just 22 years old, he released his debut album, El Hombre on Prestige Records. During the late 1960s, Martino began to experience a series of seizures that eventually required psychiatric intervention. At the time, he had been misdiagnosed with manic depression. Yet, he continued recording and performing, and in 1968 he released East! on Prestige Records. During the 1970s, he received his first major label record contract from Warner Bros. Records, and continued to record for Muse Records. For Warner Bros., he released Starbright and Joyous Lake (both out of print). And for Muse, he did Live! (1972), Consciousness (1974), and We'll Be Together Again (1976). Throughout the decade, Martino battled his seizures until 1980, when a severe seizure landed him in the hospital. A brain scan revealed the source of his problems: the doctors discovered a cluster of blood vessels in his brain on the brink of bursting. They told him he had only one more day to live. He returned to his hometown of Philadelphia and immediately underwent brain surgery. Although the operation was a success, Martino completely lost his memory, and it took two more years for him to fully recover. Initially, he didn't recognize anyone he knew and had no recollection of his career as a musician. After recovering from the surgery, he had to rebuild the part of his mind that could access musical information with the ease he once had. His father gradually introduced him to guitar playing by having him listen to his own recordings. In the end, Martino credited his computer for helping to revitalize his musical creativity. "It got me back into the manuscript and the pencil, the staves on the blank page," Martino explained to Jon Andrews in Down Beat, "and I wrote 516 studies of Japanese scales, Hungarian, Chinese, and Byzantine scales. I got deeply involved with different cultures of music." By 1982, Martino had returned to performing, but postponed returning to the recording studio. Finally, in 1989, he released The Return on Muse Records. But tragedy struck the musician once again when his mother, who had been fighting cancer for years, died in 1989. The following year, Carmen Azzara also died. Martino was left devastated and fell into a period of deep depression, limiting his social contact and drastically reducing his recording schedule. Then, his own health interfered with his life once again. "It reached a point of being diagnosed with emphysema (he had been smoking since he was eight), and not being able to breathe, not being able to feel comfortable publicly," Martino explained to Tony Green in Jazziz. "Finally, I had no choice in regards to what was necessary for my own health and career, the latter of which had been collecting dust for years." Sparked with new determination, Martino continued to use his computer to privately explore his interests in technology and twentieth century composers. And in February of 1994, he returned to the jazz scene with a vengeance. First, he accepted a studio date with tenor player Bob Kenmotsu. Then, he began recording Interchange for Muse Records, his first recording as a leader in five years. Six months later, he recorded The Maker for Evidence Records. The labels released both LPs in 1995. Jon Andrews wrote in Down Beat, "Interchange's furious bop and blues may reflect the difficulty the 50-year-old Martino encountered in re-igniting his career as a guitarist after a seven-year absence, while The Maker, recorded six months later, is thoughtful and atmospheric." In 1995 Martino embarked on his first major tour since 1976, and his career gained momentum. He released Open Road, a video documentary of his difficult life and career, and two volumes of the instructional video Creative Force. "This is a great period for Pat," engineer Paul Bagin told Tony Green in Jazziz. "This is the first time in a long time that he has been able to focus on music without any distractions or obstacles." During the summer of 1995, Martino received an honor from his own hometown at Philadelphia's Mellon PSFS Jazz Festival. He continued his prolific composing, recording, and performing schedule with yet another release, Nightwings, in 1996. In this renewed phase of his career, Martino focused on living his life to the fullest and having more fun with his music. Success became secondary. "I've reached a point where I'm looking for no pedestal other than the ground I walk on," Martino told Matt Resnicoff in the New York Times. After facing the challenges of illness and tragedy, Martino had found a new measure of accomplishment. "The greatest thing that I've achieved in life is tomorrow morning," he told Chip Stern in Musician. "To awake to the sunshine. To feel natural to all that has happened. To have no expectations." Martino's new release "Live at Blues Alley" (on APM Records, executive producer Darryl J. Brodzinski) was released on October 11, 2011. -Joyous Lake (1976), Warner Bros.